The Wirksworth Stone is a great treasure of St Mary's Parish Church. It may have been carved before 692 AD and is now mounted on the wall of the North aisle. The carved stone was found two feet below the surface, with the carvings downwards, when the pavement in front of the alter was being removed in 1820. Beneath was a stone-built vault or grave, containing a large perfect human skeleton, which has not yet been identified. The carving may have been placed downwards to hide it and avoid damage during the Reformation. At a time when few people could read or write, the stone was meant to illustrate the lives of Christ and the Virgin. Unlike a modern comic strip, the stone was probably meant to be read in vertical pairs of frames. Christ washing the feet of the Disciples. A scene favoured in the Gallican liturgy. Crucifixion : A lamb slain on a Grecian cross, evangelists holding books in the angles. This symbol was banned by the Church in 692 AD. 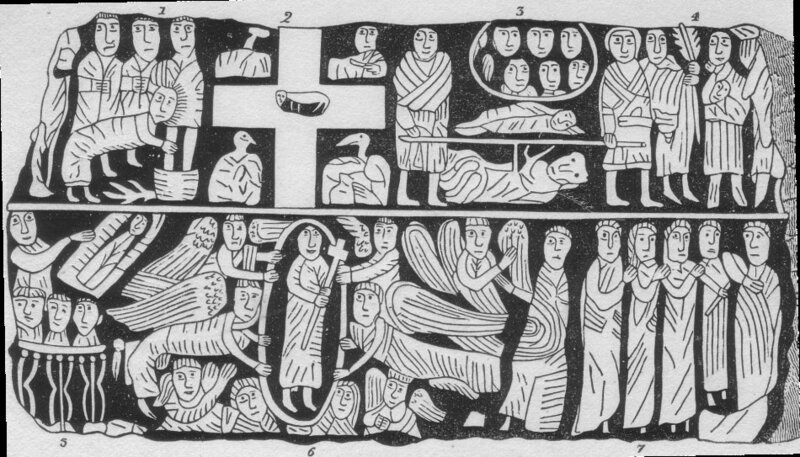 Burial of the Virgin (described in the Apocryphal New Testament). A High Priest who tried to interfere is dragged underneath. Thought to be the earliest portrayal of this scene in Western Art. The presentation in the Temple: Simeon holds Christ in his arms; the Virgin is to the right (partly broken off). The hand of God points down from above. 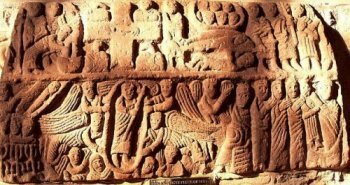 The descent into Hell of the worst sinners: Cain Herod & Judas burn in a brazier. Above, Christ releases all other souls in the form of a swaddled baby. This account was written not earlier the 5th Century. Christ ascending to heaven, holding a staff, conveyed by four archangels. The Virgin and St John below with two angels. The Virgin holds Christ as a baby ; Christ holds a scroll with one hand and points to St. Peter with the other, indicating that the disciples should spread the Word through him.